Spike TV has announced the two bouts that will be broadcast on the “UFC Prelims” special before “UFC 118: Edgar vs. Penn 2″ jumps off from inside TD Garden in Boston on August 28th. Boston natives Jorge Rivera and Joe Lauzon will be fighting in separate bouts to get the crowd going before the event shifts to pay-per-view. UFC 118 will be the promotion’s first event in Massachusetts following the sport being sanctioned there earlier this year. Rivera will take on Alessio Sakara in a middleweight scrap, while Lauzon faces Terry Etim in a lightweight bout. 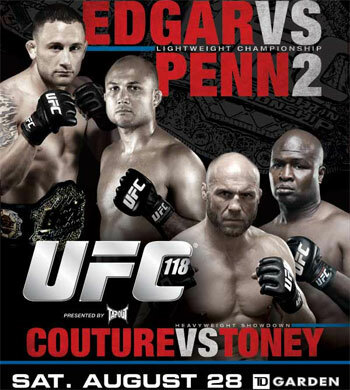 The night’s featured bout will be a lightweight title fight, with BJ Penn looking to regain the title from Frankie Edgar, who defeated Penn for the belt in their last bout at UFC 112. Randy “The Natural” Couture takes on former pro boxer James Toney in his first MMA fight in the co-main event.